Blogging is very self-indulgent. One gets to think out loud about one's interests, and share the musings with interested readers---who, with their comments, give the blogger new insight into old passions. I've been thinking a great deal this year about the graceful old Federal houses of New England---those first flowerings of design from our young country, that so well reflect the ideals, political and social, of the founders, and that for so long defined the look of most New England towns. In particular, I determined to write about a group of country houses, those with the newly fashionable oval rooms in particular, built around Boston between 1790 and 1820. I don't flatter myself that I have new insight to add to the impressive body of scholarship published about these houses over the last hundred years, but hope that you enjoy my light summaries. 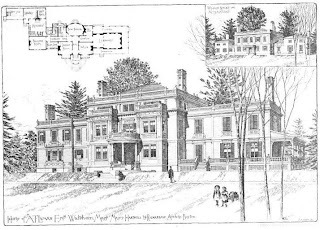 'The Vale', in Waltham, Massachusetts was designed in the 1790's by the great carver-architect of Salem, Samuel McIntyre, for merchant prince Theodore Lyman. Lyman began development of his estate in 1793, laying out a park and garden in the informal English style of Capability Brown, with a stream dammed to form an ornamental lake, and glasshouses against a brick wall, in which Camellias and other exotics were grown. The house designed by McIntyre, completed in 1798, was based on designs in English builder's pattern books, but executed in wood, the plentiful building material of New England, rather than the stone of Old England. 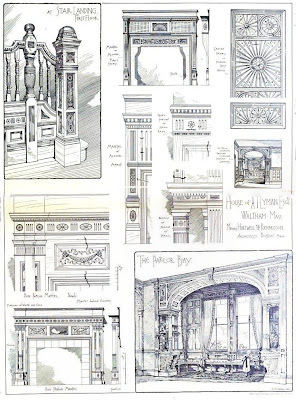 With his typical mastery, McIntyre translated details like quoins and pilasters, meant to be stone, to wood with high effect, yet the scale (the main block was only fifty feet wide), unlike its English prototypes, was domestic, not palatial. 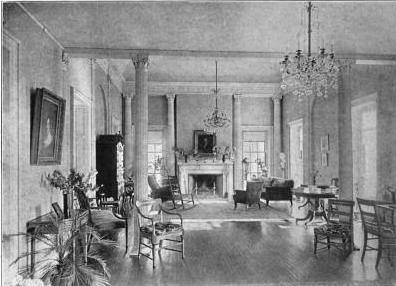 The Ballroom as it appeared in the early 20th century. The composition was Palladian, with a separate kitchen wing connected by a hypen, balanced a few years later by a ballroom wing. 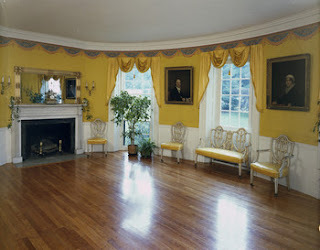 The center hall led directly to an oval room centered on the garden front facing the glasshouses, referred to by the family as the 'Bow Parlor'. Lyman lived in great style in his new house. After his death, it passed to his son, and in turn his grandson, Arthur Lyman, treasurer of the Lowell textile mills. What had been one of the grand houses of the area at the beginning of the century was by now dated and old fashioned, and not suited to the more expansive scale of living made possible by industrial age wealth. Fond of the old house, Arthur Lyman hired the local firm of Hartwell & Richardson (no relation to H.H. Richardson, about whom more in a minute) to enlarge and remodel the family homestead in 1882. Their first design was for a complete transformation of the house, and was not executed. 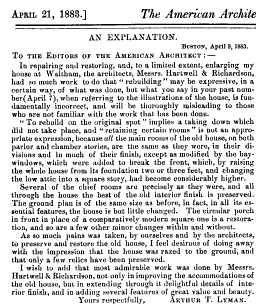 Evidence is strong that Arthur Lyman had second thoughts about how drastically he wished to alter the old family homestead, and the final design, completed in 1883 sought to save some of the character of McIntyre's design, even to the extent of re-using the second floor pilasters by McIntyre to frame the new two story bays that pushed out from the entrance front. Although respectful by the standards of the time, in fact McIntyre's elegant composition was irrevocably altered and subsumed by the new house. Inside, mantels were replaced, high wainscots installed, yet the Bow Parlor and the Ballroom both survived untouched, as artifacts of the family's past splendors. Which brings us back to the photographs that my thoughtful friend supplied. She thought I might recognize them (I'm a bit of an idiot savant at recognizing buildings from minimal evidence---emphasis on the idiot part), and indeed I did. 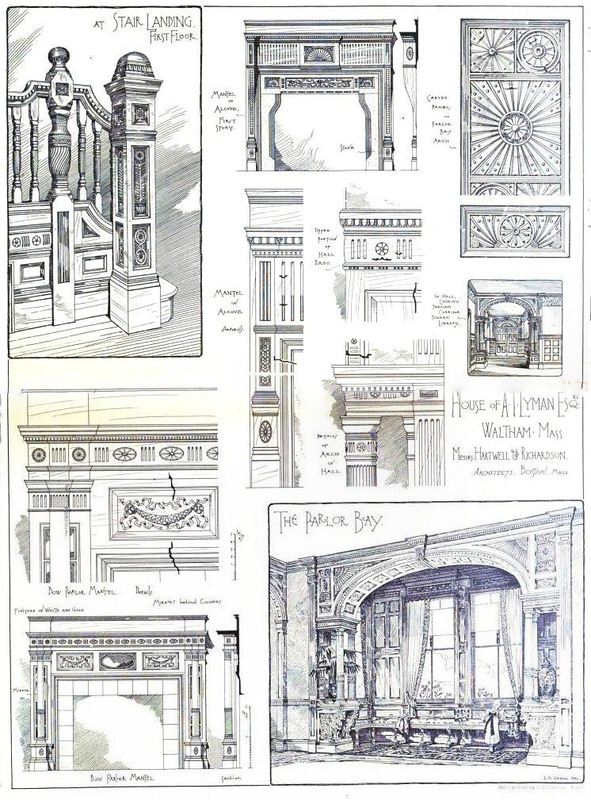 They are 21 views of the interior of 'The Vale' after the Hartwell and Richardson remodeling of 1883. In the rooms can be seen a mix of 18th and 19th century furnishings accumulated by several generations before a 1930's 'restoration' that sought to do away with many of the Victorian 'colonial' flourishes of before. Like their ancestor before them, that generation of Lymans preserved the Victorian parlor, with its oak woodwork and fire surround of deMorgan tiles. Today 'The Vale' is owned by Historic New England. Two rooms in the nursery suite. Ever thrifty, the Lymans retained the 1850's ingrain carpeting. 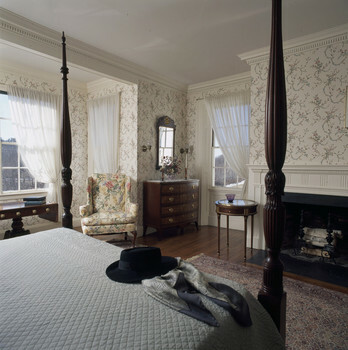 A present day view of the master bedroom, after being stripped of its Victorian decorations in the early 20th century (photo uncredited from Historic New England Website. 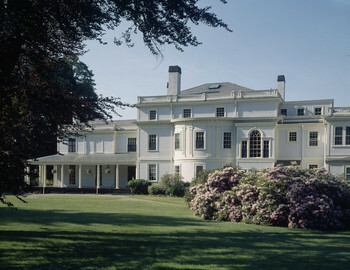 Present day view of the garden front. The central bay of the Bow Parlor remains as McIntyre designed it. For previous Dilettante posts about lost Federal country estates in the Boston area, please click HERE, HERE, and HERE. I'm working on two of my usual sorts of posts, but I'm suffering from the after-effects of a little to much food, candy, wine, and general holiday cheer this morning, so you'll have to wait. Overeating was a problem this fall as colder weather set, but I am happy to report that after the last few days, I finally have had enough food. Way enough. The local Historical Society's 1815 house, decorated for its Holiday open house. The wallpaper is an Adelphi reproduction of an early 19th century paper found in another local house (Click HERE for more). The ship in the painting, the 'Ranger', was built only a few dozen feet from this room. At dinner last night, over smoked salmon and crab mousse, friends and I were commenting about the relative lack of Holiday decorations around town this year. Was it an effect of the poor economy, or was it because our village suffers from a surfeit of 'Good Taste', and therefore people are too timid to put on a display that doesn't involve more than a few white twinkle lights--here the Dilettante confesses that no matter how much 'Good Taste' he may suffer from the rest of the year, he does love the occasional over the top kid-pleasing, crowd-pleasing, awe-inspring Christmas light display. Nothing says Christmas like electric Santas visible from space. The local bookstore after the rush. Earlier, the counter was a frenzy of gift-wrapping . For those who don't have a good independent bookstore nearby, I can only say I'm so sorry. For me, the Christmas shopping season begins not on the Friday after Thanksgiving, but on the 23rd of December. If only the canned Christmas music that has accompanied my daily errands in stores for the last six weeks would wait that long, the world would be a better place. Without, a local restaurant in the former blacksmith shop (click HERE for more) had almost the only bright lights on Main St. Within, a bartender wearing a Santa hat was ready with two martinis for us. That's my idea of a Santa. At the other end of the Christmas decorating spectrum was the sweet, restrained Charlie Brown tree at the local Library. Under it were placed donated presents to be taken later to the area homeless shelters. Beneath the gloss of affluence that veneers our area, shelter occupancy and food pantry demand are at an all time high, even as our accidental Governor, although once homeless himself, continues to demonize the poor. In this part of Maine, the biggest Santa this season has been Stephen King. His output of horror stories belie a very generous man, who has given tens of millions to this region, in the most thoughtful and personal of ways. Click HERE for that story. For all who love books and community, this Op-Ed piece from today's Times. Read it, and make certain that your next book purchase isn't online. On the first Sunday in November, the weather was gray and indifferent, not pleasant enough to encourage outside chores, not bad enough to stay inside with a book. Even as I was contemplating this dilemma, knowing that outdoor chores were really the correct answer, the phone rang. 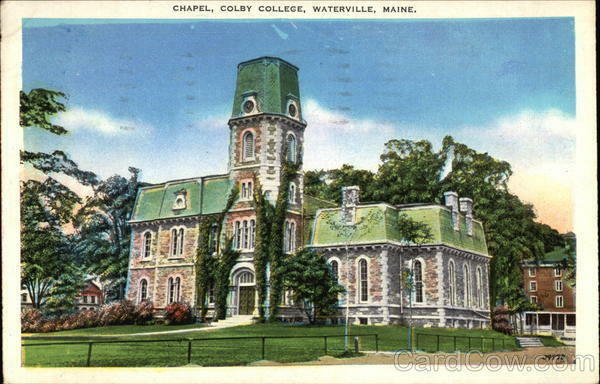 It was Sidekick, in much the same mood, wondering if I might be interested in a road trip 'up' to the Colby College Art Museum in Waterville (although actually due west a couple of hours, like all trips inland in Maine, it feels 'up'). Road trip with a favorite partner in crime or chores? The decision took about 1.3 seconds. Further down the road, this handsome whitewashed brick Federal was once the summer home of Ellerton Jette, who was the chairman of the Hathaway Shirt Company, whose long defunct factory was once Waterville's major employer. Here was housed much of the collection of American art that Jette later donated to the Colby Art Museum. For those too young to remember, 'The Man in The Hathaway Shirt' was one of the most successful ad campaigns of all time. Hathaway was a small regional manufacturer when Ellerton Jette went to David Ogilvy, then arguably the most powerful man in advertising, with a tiny budget and convinced him to take on the Hathaway account. The rest is history. When the Dilettante was little, Dunham's of Waterville, with its rows of pastel oxford button downs was where we all got supplied with our Hathaway shirts and Bass Weejun loafers. Not quite two hours later, after a drive through China, we arrived at Colby. The campus is a handsome one, created in the 1930's. It is a classic of its era, the creation of one Dr. Bixler, then the ambitious president of what the then small regional college. Sitting on Mayflower Hill, its Georgian buildings and quadrangles were inspired by the great early Universities, including Harvard and the University of Virginia. 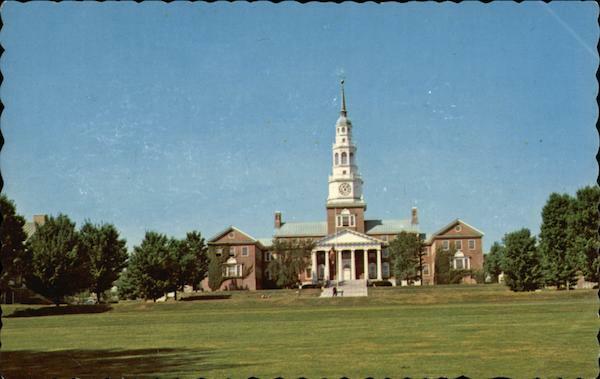 The Miller Library on the 'new' campus at Colby College, for years the tallest building in Maine. We parked and strode to the museum entrance, only to be confronted with a chain link fence with a sign that said 'Closed for Renovation until November 8th'. We had checked the schedule online before leaving home, and on the museum's schedule page found no evidence that the museum was anything but open. As it turned out, the closure was mentioned on the home page, but we had googled 'schedule', thus by-passing that page. You'd think those smart people at the museum would have troubled to mention it on their schedule page also, wouldn't you? Thank-you. So would I. Especially on the schedule page. Really. The museum was closed to prepare for the construction of the new Lunder Pavilion, to house a collection of artworks donated by the Lunder family, heirs to the Dexter Shoe fortune. While I find it a handsome design, I question the agressive way in which it breaks scale with the surrounding buildings. 21 3/4 in. x 26 1/4 in. Regrouping, we decided to save the day by going through Rome---and then continuing on to South Solon and visit the South Solon meeting house, with its amazing frescoed walls, for our dose of art. Hungry, we stopped for lunch in Skowhegan, an old mill town on the Kennebec, where a few years ago HBO filmed 'Empire Falls', based on the novel of the same name by Richard Russo, about...an old mill town. The first time I went to Skowhegan, decades ago, the last log drive was taking place on the Kennebec---millions of logs being floated downriver for processing. Not environmentally sound, but a stirring sight nevertheless. The 'Empire Grill', the old diner from the movie, had closed, and a sports bar offered no sustenance. On the strip heading out of town, we found a family restaurant, in what appeared to be a converted Pizza Hut---the architecture is unmistakeable. Perhaps here I should mention that a friend refers to the road out of Skowhegan as 'the driveway to Quebec', and one definitely senses the French Canadian influence in the area culture. For these two hungry tourists, the defining moment was when we spotted Poutine on the menu. Somehow, in a lifetime of trying all foods bad for me, this one had eluded me, a Canadian logger favorite of French Fries covered with brown gravy (ever the effete elitist, I was about to type 'sauce', but in fact, it was gravy) and melted cheese curd, and in our case, crumbled bacon. Appalling in concept, delicious in execution. Poutine. Okay, so it wasn't Lutece, but trust me, we licked the plate clean. We reached Solon in the mid-afternoon bellies full, arteries clogged (did I mention that we also had the restaurant's home-made meatloaf sandwich, well prepared and delicious---comfort food on a crisp fall day,on the largest slices of bread I have ever, ever, ever seen? It was a sandwich for Brobdinagians). Solon is an old town, its streets lined with handsome buildings that have see better days. In this part of Maine, the way of life is often hard, employment scarce, and the smug pleasures of the coast, romanticized and ordered to the satisfaction of the well to do, are far behind. Up in the middle of nowhere: the Solon hotel anchors the town. A friend said 'Oh yeah, the Solon hotel. R.E.M. played there'. One learns to expect the unexpected in rural Maine. Across the street, this oddly shallow 19th century house, not even 12 feet deep, is irresistable. A handful of early 19th century farmhouses survive on this high ridge--this example has escaped modernization, and has yet another lovely pattern book door surround. It sometimes seems that the early builders could do no wrong. We decided to go home by way of Athens, and mapped out our trip, only to find that the road petered out to a single dirt lane. With the light waning, we decided this was not the day to be lost driving about the woods of Maine, and turned around and head down to I-95. All was not lost, though, for we were rewarded on that back road by this view of Saddleback Mountain and the Rangeley hills an hour distant. The view from a field near Athens. Labels: Architecture, Art, Asher Benjamin, Colby College, Skowhegan, Solon, Waterville.